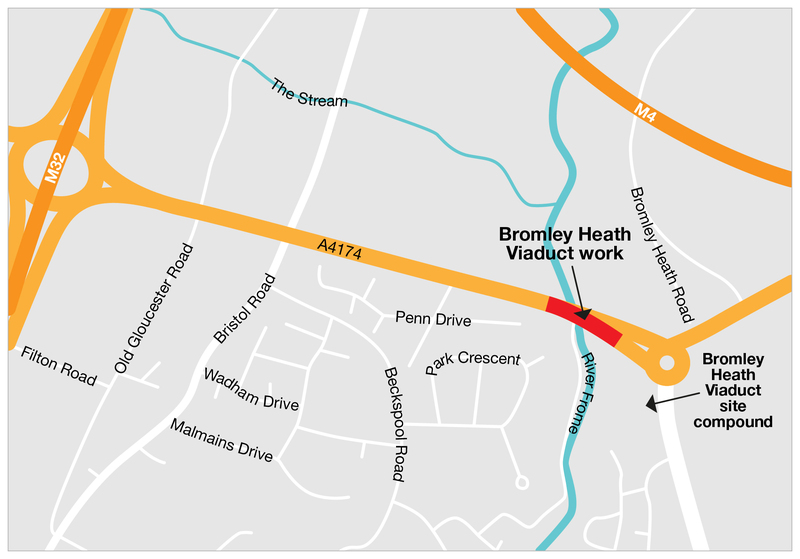 We are carrying out major maintenance work to the southern Bromley Heath Viaduct on the A4174 ring road, between the Bromley Heath roundabout and the Hambrook traffic lights. The southern viaduct was constructed in February 1966 as a single carriageway road over the River Frome and in 1988 was changed to a dual carriageway. Today, the viaduct carries approximately 55,000 vehicles and 500 cyclists a day. If we do not strengthen the bridge, it will have to be closed to all traffic. Watch our short video that explains the work required on the Bromley Heath Viaduct. We have already undertaken some preparatory work. This includes assessing wildlife habitats and clearing vegetation as well as the construction of the site compound and a Bailey bridge for access underneath the viaduct. Work for the Bromley Heath Viaduct was confirmed by councillors to begin in July 2017 for a maximum duration of 52 weeks, this has now been be reduced to 33 weeks after funding from the Local Enterprise Partnership Economic Development Fund (EDF) was agreed by the West of England Joint Committee.